Gleaners food bank receives donated food and nonfood items that are disbursed to charities that serve those in need in our community. Gleaners Food Bank of Indiana accepts donations. Donate Now. 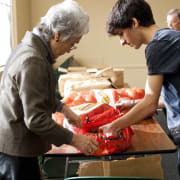 Would you recommend Gleaners Food Bank of Indiana?